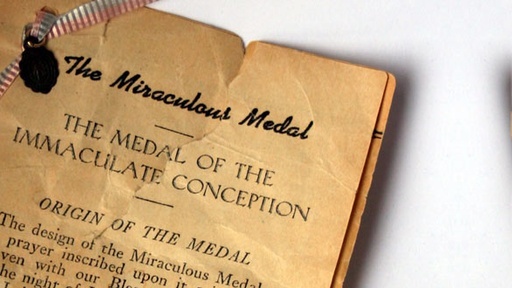 The only reminder one woman has of her birth parents is a medallion of the Virgin Mary that was attached to her diaper when she was presented from a home for unwed mothers to her adoptive parents. Homes for unwed mothers were a national trend from the beginning of the 20th century until the 1970s, when they fell from use. Follow this emotional story as the History Detectives head to Missouri to help our contributor finally find her birth parents and the home where she was adopted. Also with Gwen Wright First Movie Studio Could a broken gateway once have been the grand entrance to a Hollywood studio? Also with Gwen Wright Black Tom Shell Is this shell from a devastating act of foreign sabotage on American soil? Also in Post War: 1945-1960 Leisurama Homes What happened to the Leisurama homes apparently widely sold in Florida? Also in Post War: 1945-1960 Pop Lloyd Baseball Field Why was this baseball field named after an African-American ballplayer in a time of racial tension? Also in Season 3 Civil War Balloon Could this piece of frayed material be from the country's first military airship?